If you were to take a snap shot of your life right now, would the picture show you doing something you truly love? Are you following a path that inspires you? It took me many years to realise that just because I could do something, it didn’t mean I should do something. I first had to learn how to tune into my inner why. I used to think that being unemployable was a curse, something to be ashamed of. I envied girls who seemed to be able to slot into any job with ease. I’ve realized since that I was never meant to work in a regular job. Many people see work as functional, a necessity and a chore, but what if you could view work differently? It can take a long time to have that ‘aha’ moment, that moment when you realise your life’s purpose was staring you in the face the whole time. In school I was never very good at following rules. I didn’t consider myself to be a rebellious child, just a misunderstood one. At the age of nine, I started my own business making bookmarks and toys out of scrap felt. What started out as a few cents here and there, quickly became a thriving enterprise that saw profits of up to $20 a week. As I grew older, I forgot the joy that came with making something new and lost my entrepreneurial spirit. The outer world took over and I started to follow the same path as everyone else. As a teenager, following the corporate mandate to put on a smile every day and serve highly processed food just didn’t inspire me. I had a string of jobs ranging from being a silver service waitress at a five star restaurant, to working as an executive at a large international corporation. I was hired and fired, quit some jobs and sabotaged others. Some have said that my inability to conform was partly because I was labelled as having ADHD or being ‘a bit Aspie’. I actually prefer the term AHAIG = Accelerated, Hyper-Aware, and Incredibly Gifted. As someone who is naturally pretty hyper, I was born with great capabilities; however most employers and teachers saw those capabilities as distractions, faux pas and fundamental flaws. I used to think that being unemployable was a curse, something to be ashamed of. I simply did not fit into a corporate world where you had to do your time and work your way up the corporate ladder. After years of trying and failing to fit in, I quit trying to be employable and started working as a freelance marketing consultant. I had no idea that this way of working and collaborating (Freelancing) would become the norm for a lot of people, not just misfits like me. If you enjoyed the show, I’d love for you to leave a rating and review on iTunes. It only takes a moment and your review and rating of the show can really help this show reach more listeners. To leave a review, you’ll need to login on your desktop or laptop computer, so if you do, I’ll know you really wanted to and will be so grateful. Your Brilliant Un-Career features a bonus private podcast interview with Shar Moore, who has dedicated her life purpose to helping you find yours. 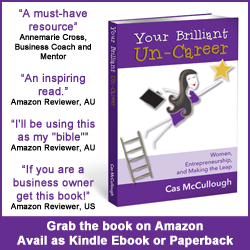 Listen in for tips on how to find your right path and read Chapter 1 of Your Brilliant Un-Career for more on this topic. Access this interview for free here, along with 32 other bonus business building podcast interviews, templates, worksheets and motivational affirmations.